Unbelievable Discounts at DirWell.com - You Wouldn’t Want To Miss! 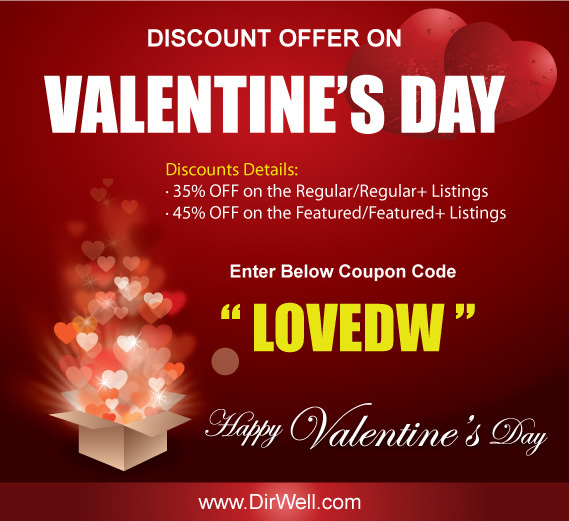 Unbelievable Discounts at DirWell.com – You Wouldn’t Want To Miss! If you are a website owner or an entrepreneur who is new in the field and is looking for a gateway to explore more, to promote your web sites, to give a head start to your online business and gain more online recognition…you are exactly where you need to be…at DirWell.com! Directory Well is a platform that offers people a dynamic all-purpose web directory that has been crafted to provide SEO advantages to your business. At DirWell, we take on the responsibility to offer to people (owners of websites, webmasters, SEO companies and others) incentives so that they challenge their thinking and expand their horizons. We understand that as a website owner, be that any genre, you are looking at promoting your business and so we responsibly help you and work towards making your business grow & flourish. DirWell.com came into existence in the year 2009 and since then it has been growing steadily and proving its potential. We have a team of highly experienced professionals who have a deep and thorough understanding of the local as well as the international markets. As a result, DirWell makes the job very easy for the clients, as all you have to do is simply choose which category and listing your website(s) will feature under…the rest (in terms of traffic), we assure we will handle on your behalf. As a website owner or a blogger, one of the major concerns is pleasing search engines. What majority of us overlook is the fact that what we truly must do is capture & retain our reader’s interest! The truth is that enthralling content is what makes a visitor stay on your web page and spend time looking around. At DirWell, we are proud that we have a team of dedicated and knowledgeable writers as well as editors who give their 100% to helping our business grow. We guarantee that our work is top-notch quality, we have a huge index, our listings are hand-picked & manually approved, plus we offer unbelievable discounts! 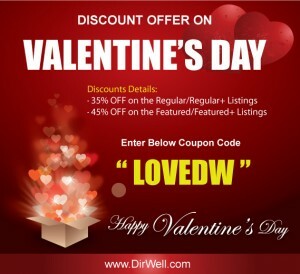 We are offering an unbelievably huge discount on the coming Valentine’s Day 2012. We are aware that the existing pool of clients appreciate our services & we would like to make the most of this opportunity and give you a motive to try more of our services at Web Directory. while submitting your website on our Submit Page!